Method #1: How to remove a tree stump by hand. 1. First, use a limbing saw or chainsaw to eliminate any lower branches from the trunk. 2. Eliminate the upper part of the trunk, but leave enough to use leverage. 3. Pick a shovel, use a mattock and digging bar to reveal the roots around the stump. 4. Wash and rinse the dirt away to see more of the roots using a hose or power washer. 5. Then, cut the major roots with the use of an axe. 6. Try to push the trunk and if more roots reveal, cut them with an axe. Proceed with the pushing and pulling of the trunk until it is entirely uprooted. 7. If the trunk won’t budge after all your efforts, wrap the chain around the stump and attach it to a four-wheel-drive pickup truck. 8. Keep on pulling forward and reversing the truck until the trunk is uprooted. Method #2: How to remove a stump using chemicals. 1. Using a chainsaw, remove the stump as much as possible. 2. Around the perimeter of the stump, drill holes with 1 inch in diameter. Then, move inward with a distance of 3 or 4 inches from each hole and drill some more. The holes should be between 8-12 inches deep. Please note that its depth will depend on the size of the stump. 3. Drill new holes around the side of the stump. Make sure it meets with the other holes to create 45-degree angles. 4. Into each hole, pour an ample amount of potassium nitrate. 5. Then, fill them with water. 6. Wait until it becomes very spongy, possibly about four to six weeks. 7. 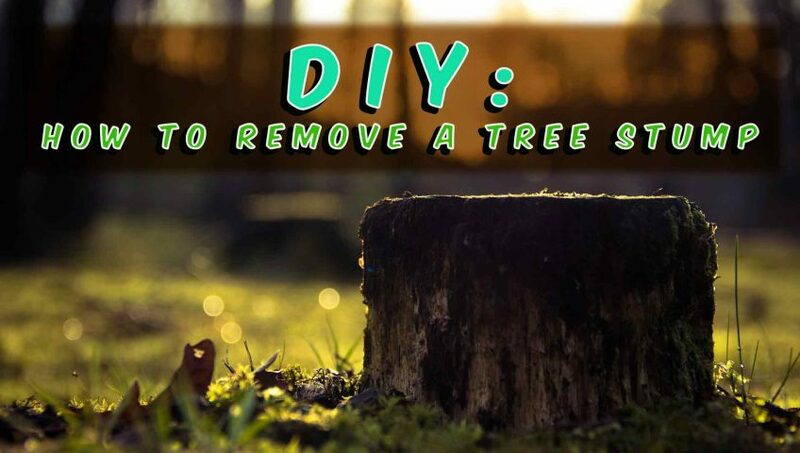 Break up the spongy stump using an axe. 8. (Optional) Penetrate it with kerosene or fuel oil and let it sit for another week or so. Method #3: How to remove a tree stump by burning. 1. Make a hole about 8-10 inches deep into the centre of the stump. 2. Clear the rubbish inside of the hole. 3. Continue drilling the holes and leave about 1-inch each hole. 4. Put potassium nitrate into each hole. 5. Then, pour hot water in it. 6. Pour more water into the holes until the potassium nitrate dissolves. 7. On top of it, place the scrap wood. 8. Wait for it to ignite after you light up the scrap wood. 9. Inflame it, let it burn and smoulder until it is completely gone. 10. Using the shovel, break up any large roots or pieces that was left by. 11. Fill the hole with enough soil to cover the gap. Method #4: How to remove a tree stump by rotting. 1. Make a hole into it about 8-10 inches deep using a drill. 2. Stuff all the holes with a high-nitrogen substance. 3. Fill each hole with water. 4. Then, remove those pieces that gradually soften. 5. Put as much dirt in the hole. Furthermore, if you’re planning to do one of these four methods we discussed above, consider that you have to give your time, effort and even money. And just so you know, you may have to buy or rent some of the tools you need for the job. But if you think it will be hard for you and you’re looking for the best way on how to remove a tree stump with ease, let the pros handle it. Tall Timbers Tree Services got you covered! We have certified arborists that know how to deal with your tree needs. And we provide awesome deals and offers. You can also read more informative articles and blogs on our website. And, are you planning to get the best treatment for your trees? Check out this article: Reasons Why You Need The Best Tree Removal Service.